Whether you want to spend a little coin, or keep it simple, we’ve got some great options! The hardest part about those months and even years after the kids are born is finding time for the two people who started it all! Like any relationship, your marriage needs to be nurtured and supported in order to survive, so you have to put a little effort into the equation. Of course, effort doesn’t have to mean expensive. But it does mean taking the time—scheduling it, if necessary—and giving actual thought to what you both might enjoy. It’s probably hard to imagine taking the time, when your baby is little, but as your kids get older, and you feel more comfortable leaving them with family or babysitters, you can expand the range of your outings, even stretching to an overnight or multi-day trip ‘sans’ little ones! You start out at one restaurant for appetizers, move on to a second one for entrées and a third for dessert. The idea is to keep it fun, and try places you’ve never been to before, or wouldn’t try with the kiddo in tow! If you’re really brave, you can open up a map app, show all the restaurants around you, close your eyes and point! Whichever restaurant your finger lands closest to is where you’re going, even if it involves paper napkins and golden arches! How about a rousing and competitive round of bowling? Or an old fashioned, hand holding roller skate, to be be followed by shakes (just one – with two straws) and sundaes at the local ice cream joint? Harken back to the days before kids and have a little fun with it. Karaoke anyone? Or how about a picnic at the park after a leisurely bike ride, hike or competitive game of mini golf? Whatever you choose, keep it fun and share a laugh together. Whether it’s a cooking class or candle making, pottery or cake decorating, find a class that you will both enjoy and book it. A firm commitment will give you less options about wiggling out, which new parents sometimes do! Even better if this class meets more than once, so you can make it a regular thing on your schedule. If you can get away for a whole night, book in at a hotel in your city and take advantage of all the available services including the gym, the pool, room service or spa treatments! You never have to leave the hotel to have a great evening and a good night’s rest! Or maybe not… that’s up to you! Many high end restaurants offer delivery service these days, so even if you can’t get yourself to a swish joint for the night, have it come to you! No reason to eat pizza when there are so many gastronomical delights to enjoy! If eating isn’t your thing, a simple picnic in front of the fireplace is just the ticket for a low stress evening. Better yet, have each of you bring something to the picnic and see what combination you end up with: Calamari and guacamole, anyone? These are the memories you’ll laugh about for years to come. Whatever you choose to do, make the time to do it. It’s an investment in your relationship that you will never regret. Do you have a favourite ‘date night’ idea that you would like to share? Great ideas, I love number 1 cause it’s something I can manage to do win a new baby in the house. I quick date night is just what I need. 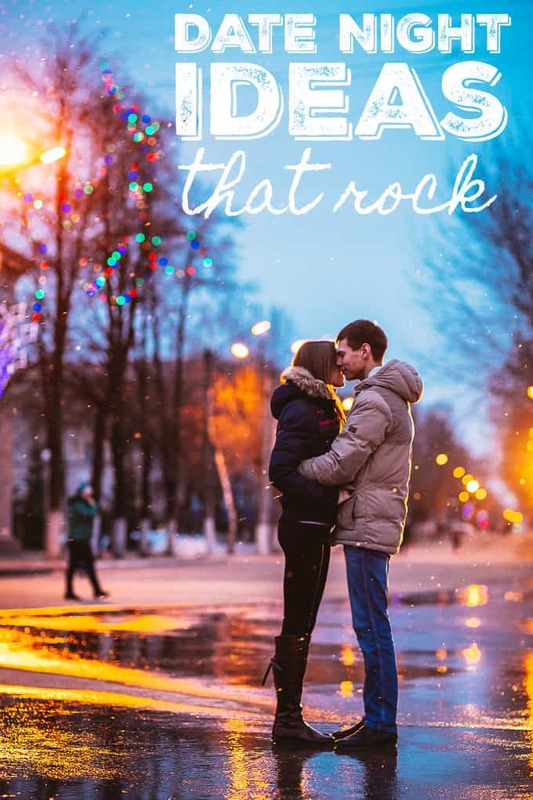 Some great tips, need to plan those date nights just so you get out of the daily routine that is so easy to get stuck in. I always liked a night out at a movie. I’m all for the random dinner date. Love being surprised. These are some great ideas. I love the taking a class one. Taking a class together is a great idea for something different. these are great ideas , and very affordable to ! I would say a surprise night were you have to plan something new , star gazing , walks at the beach , drive in , make a jar full of fun ideas then pick out of it so its random fun ! Lots of fun ideas! We’ve started a Monthly Date Night for 2017 so this will help! Great tips to ensure a great date.